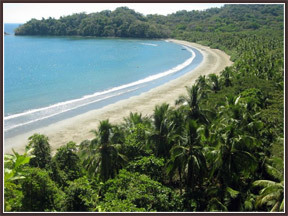 For lovers of ecology and animals of the Curu Wildlife Reserve is one of the most prominent of the Nicoya Peninsula. Excellent tropical paradise for animals and nature. Curú is a private company that is a farm hand, agriculture and especially the protection of flora and fauna. Curú has a rich and diverse wildlife in various habitats, marine areas, mangroves, dry forests, tropical moist and farmland. The Pacific ridley turtle, hawksbill and green sea turtles lay their eggs. Artificial reefs have been built in the Bay of Curú that have helped increase the number and diversity of marine life on the coast. The farm was founded in 1933 by Frederick Schutt and remains family owned. In 1974 part of the estate was occupied by settlers who settled around the village of Blue Valley today. To avoid further damage to the nature of the Schutt family sought government support, and in 1981 obtained the status of "Protected Forest" for most of their lands. Furthermore, in 1983 created the National Wildlife Refuge Curú.